What conversion functions exist to transfer precipitation forecast in mm to expected snowfall in cm? Simple rules of thumbs as well as more advanced methods would be of interest. 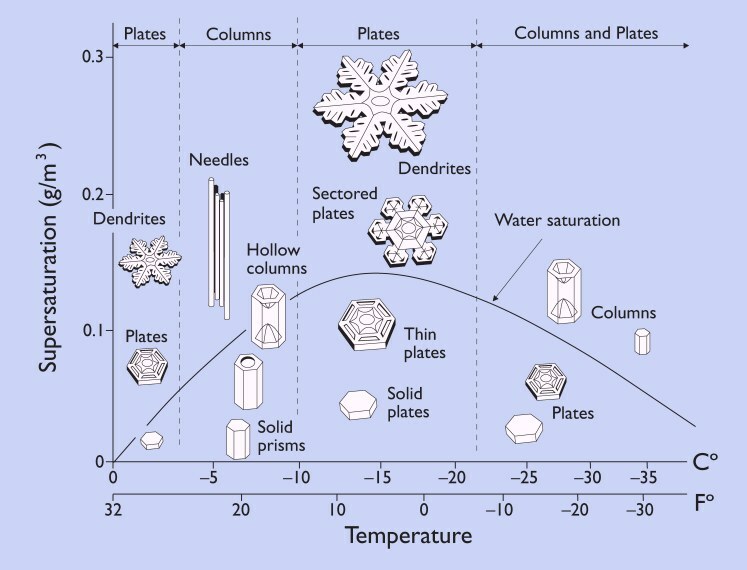 The snow density, which is the "conversion function" you are looking for, of fresh fallen snow varies with atmospheric conditions, vapour saturation and temperature since these parameters determine the snow grain morphology (See this figure from SnowCrystals.com; I leave it as a link for copyright reasons). Densities can vary from as low as < 100 kg m-3 for cold conditions to maybe > 400 kg m-3 for wet snow. This essentially cover the spectrum for a normal snow pack. If you, by your question, are thinking about weather services reporting how much snow will come from a snow fall it is by no means a an easy thing to predict since you may "know" the amount of precipitation from a model, but you will have more difficulties knowing the density of the fallen snow unless you device a classification based on the atmospheric conditions during snow fall (based on snow crystal structure as in the figure). Hence for most purposes, the snow pack thickness is of little value and most will want the water equivalent of that snow, i.e. how much liquid precipitation it corresponds to. If snow is falling during drifting conditions, the density may become higher than the falling snow itself would have resulted in. This is because with wind drifting, snow crystals are reduced in size by crushing and can hence be more densely packed. With time the snow pack will densify due to metamorphic processes. This will cause the snow to decrease in thickness with time. But that is perhaps a different question since yours were about fresh snow. Often a certain climatology will trend one way in these numbers, e.g. maritime winter climates such as in California tend to get warmer storms so you generally get between 10 and 15 in/in and in Utah/Colorado which have continental climates you generally expect 15-20 in/in unless it's late spring. Not the answer you're looking for? Browse other questions tagged meteorology precipitation snow or ask your own question. What is the finest horizontal grid spacing that Eulerian grid-cell air-dispersion models should use? NCDC Snowfall Data - Interpretation? Can I use radar data to estimate snowfall, or is there a better way?